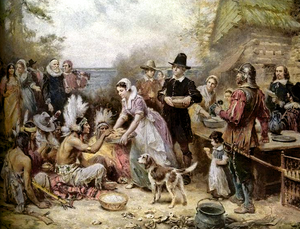 The First Thanksgiving, painted by Jean Leon Gerome Ferris (1863-1930). My doctoral advisor at Duke, Grant Wacker, sent this along, with the comment, “It offers the usual Hall wit, erudition, and elegant writing style.” Yes, it does. Here’s a taste, and Happy Thanksgiving to all! This was no idle question, for it captured the uneasiness many of us feel about the threads that connect past and present. Are our present-day values and practices aligned with the historical record, or have they been remade by our consumer culture? Is anything authentic in our own celebrations of Thanksgiving? And isn’t the deeper issue what the people who came here were like, not what they ate in 1621? To return to the first of these harvest feasts is to return to the puzzling figure of the Puritan, the name borne by most of the English people who came to New England in the early 17th century. What did they hope to gain by coming to the New World, and what values did they seek to practice? The easy answers simplify and distort. Nathaniel Hawthorne, who came along a couple of centuries later, bears some of the blame for the most repeated of the answers: that Puritans were self-righteous and authoritarian, bent on making everyone conform to a rigid set of rules and ostracizing everyone who disagreed with them. The colonists Hawthorne depicted in “The Scarlet Letter” lacked the human sympathies or “heart” he valued so highly. Over the years, Americans have added to Hawthorne’s unfriendly portrait with references to witch-hunting and harsh treatment of Native Americans. But in Hawthorne’s day, some people realized that he had things wrong. Notably, Alexis de Tocqueville, the French writer who visited the United States in 1831. Tocqueville may not have realized that the colonists had installed participatory governance in the towns they were founding by the dozens. Yet he did credit them for the political system he admired in 19th-century America. After all, it was the Puritans who had introduced similar practices in colony governments — mandating annual elections, insisting that legislatures could meet even if a governor refused to summon a new session and declaring that no law was valid unless the people or their representatives had consented to it. Well aware of how English kings abused their powers of office, the colonists wanted to keep their new leaders on a short leash. Tocqueville did not cite the churches that the colonists had organized, but he should have. Like most of their fellow Puritans in England, the colonists turned away from all forms of hierarchy. Out went bishops, out went any centralized governance; in came Congregationalism, which gave lay church members the power to elect and dismiss ministers and decide other major matters of policy. 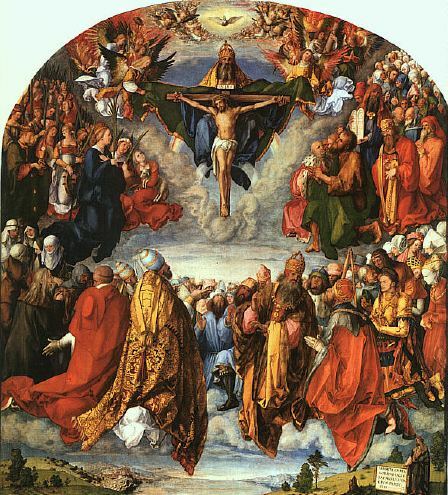 As many observed at the time, the Congregational system did much to transfer authority from the clergy to the people. For this reason, no Puritan would have agreed with the ethic of “self-reliance” advanced by Hawthorne’s contemporary, Ralph Waldo Emerson. Instead, people should agree on what was right, and make it happen. . . . This entry was posted in Uncategorized and tagged Alexis de Tocqueville, holidays, Nathaniel Hawthorne, New England, Puritan, Puritanism, Ralph Waldo Emerson, Thanksgiving. Bookmark the permalink.